Pumpkins must be decorated in the theme of Breast Cancer Awareness. The color pink must be visible somewhere on the pumpkin. Be sure to complete your entry form and turn it in at the ticket booth or pink pumpkin tent near concessions. Do not cover number on the bottom of your pumpkin. This number is assigned to you and will be used to keep judging anonymous. If it is covered, we will not know who decorated the pumpkin and cannot award your prize. No vulgar or lewd images will be accepted. CornDodgers Farm, LLC and Champions of Hope reserve the right to disqualify any inappropriate pumpkins. Pumpkins may be decorated at CornDodgers Farm Annual Family Fun Day, October 13, 2012 with free craft supplies provided while they last or taken home to decorate. 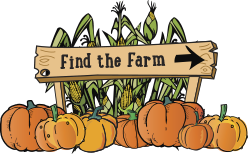 Pumpkins must be turned in by 6 pm, Sunday, October 14, 2012 to be eligible for judging. Judging will occur at the Champions of Hope Annual Event, Saturday, October 20, 2012. Peoples’ Choice and Judges’ Choice will be awarded prize baskets worth at least $50. Winners will be notified with 5 days. If the winner cannot be contacted within 7 calendar days, an equivalent cash donation will be made to Champions of Hope in his/her name. Pumpkins will become property of Champions of Hope and displayed at their event October 20, 2012 and any other events as The Foundation sees fit. Also help us paint the farm pink! Wear pink to CornDodgers Farm on Family Fun Day, October 13 and enter a drawing to win a free pass to our Haunted Trail. Four winners will be drawn Saturday night. You do not need to be present to win. Next post: It can be done!